Denim has never gone out of style, and that is based off of the fact that it is a timeless piece. Yes, of course there are jeans that are distressed and may not stay in style forever. But denim, overall, will never fade away. Over the years, the distressed look and the fit of denim has changed drastically to please the era. Depending on what era you are dressing for, the fit of the jeans will be different. In the 1950's, dark wash and stiff fabric marked the beginning of fashionable denim. This look was geared toward straight legged, high waisted jeans. The 1960's and the 1970's blended together, where they started creating more feminine cuts and the flare jeans came into style. In the 1970's, bell-bottom pants and silhouettes emphasizing the waist were heavily in style, until polyester clothing quickly went out of style. There are only two words for the 1980's. Acid wash. This style was worn in many different ways, such as high-rise, low-rise, boyfriend cut, cut-off shorts, etc. The 1990's brought mom jeans and baggy jackets into the picture. This era established the look of pre-millenial decade. When fashion reached the 2000's, a mixture of eras became vogue. 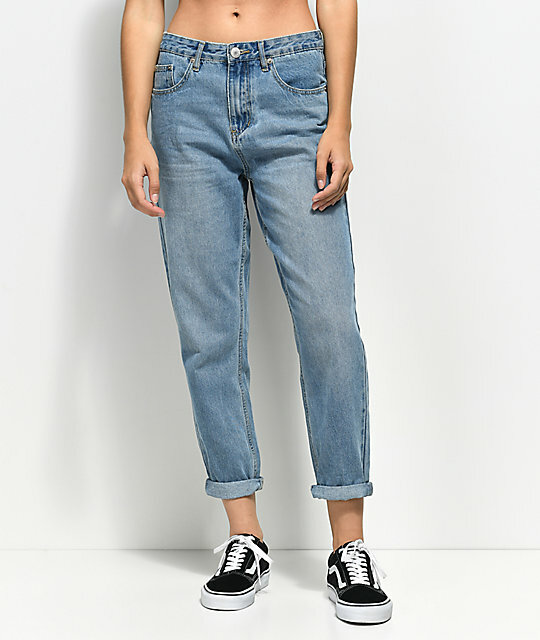 Currently, what is being sold in fast fashion ranges from the 70's to the 90's. People are mixing and matching trends, and bringing back trends that have been relevant in the past. Go back in time and figure out what era best fits you, literally and figuratively. They're simple, comfortable, and perhaps one of the most versatile pieces of clothing you can own: we're talking t-shirts! If you're like me, you probably buy a tee every time you go to the beach or to a concert--out of all the drawers in my dresser, my t-shirt collection takes up the most room. T-shirts are a staple for lounge-wear, pajamas, and active-wear, but have you ever realized how much you can wear them as part of your daily wear as well? We chose one simple t-shirt and styled it in tons of different ways to show just some of the many easy ways a single shirt can be worn. Keeping all of these possibilities in mind extends the smallest wardrobes into endless possibilities that keep all of your clothes exciting and fresh. This eliminates the need to buy more clothes, freeing up some space in your closet and dresser, and it certainly saves you a few bucks, too! Here is a montage of style, profiling one single t-shirt. Imagine all of the t-shirts that you've collected over the years and enjoy! With a pair of black denim shorts and a denim jacket, this look couldn't be any easier. 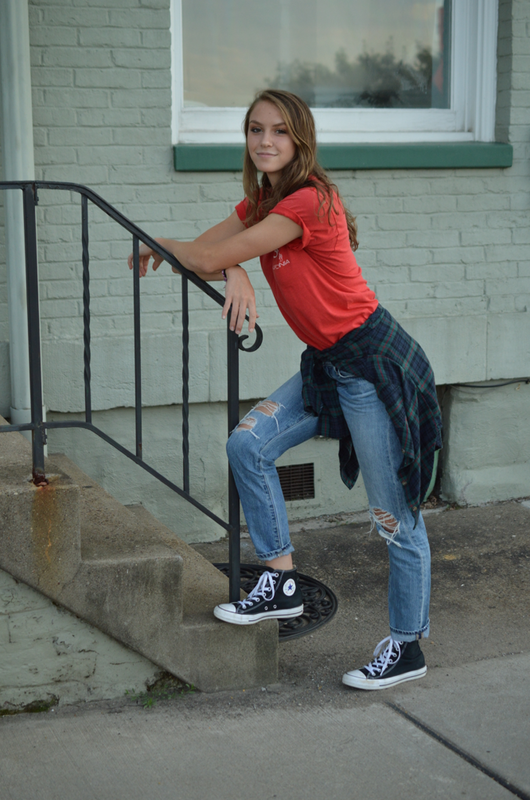 A pair of high-top Converse give it an edgy, timeless flare, and the jacket is the perfect layer for transitioning between hot summer day and cool summer night. This look is great for spring and warm fall days, too. For high-waisted shorts, tuck the shirt into the waistline so that the full effect of the style of shorts is achieved. For a slightly dressier and more feminine style, simply wear the t-shirt over a lightweight dress! Of course pairing the shirt with a skirt will achieve the same effect, but why not get a little more use out of a sundress by turning it and the t-shirt into a whole new ensemble? For a more flattering look, tie the shirt into a knot at the waist. Wear this look with a pair of boots or sneakers. Layer it with a jacket or a blazer. For a cooler weather outfit, tuck a t-shirt into your favorite pair of jeans and tie a flannel around your waist. A pair of sneakers finishes the casual look in a perfect way, and for added detail, try cuffing the sleeves of the shirt. This immediately transforms a big, casual shirt into something more form-fitting that is more appropriate for different styles. These looks are perfect for sporting your favorite band, sports team, or place in cute ways! Do you have any of your own unique ways to wear a t-shirt? Share them with us! Sometimes, styles can repeat themselves in history. Some styles come and go more easily than others. In fashion today, many outfits revolve around gauchos, bell-bottom pants, midi dresses/skirts, ankle-length maxi dresses, frayed jeans, and tie-dyed shirts. This sounds very, very, familiar . . .
Could it be . . .
Could it really be . . . This generation grew up watching "That 70's Show", and is now dressing like Ashton Kutcher and Mila Kunis themselves. Don't be afraid to add a little flare to your outfits and dress like these actors did for their show!! Happy Sunday! Ever wonder why that blue shirt just never goes well with your skin tone? Here's a breakdown of colors that compliment and do not go so well with your skin tone for a great day out! A trend that seems to have made it's way back into modern times is statement sleeves. This type of trend is most popular in the fall and winter time due to the colder weather. It's a way for people to only wear one layer of clothing, in their workplace, schools, and even in the comfort of their own homes, while still making a statement. They can easily be paired with a bold statement necklace. 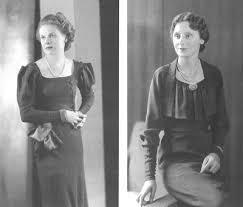 In the 1930's, a popular trend that took place was bringing attention to the shoulders. Whether that be through shoulder pads, butterfly sleeves, banjo sleeves, etc., people loved bringing attention to their shoulders. This trend took place directly after World War II, when fashion, for both men and women, pointed directly at the exaggerated shoulder. Something that I have noticed in modern day fashion, is that this trend has never really gone away. While prancing through a thrift store, or even popular modern-day vogue clothing stores, these trends have never truly died. Ruffles on shorter sleeves has made it's statement in fashion, as well. For some ideas on how to bring Stevie Nicks' style into your modern wardrobe, have a look at the outfits below! 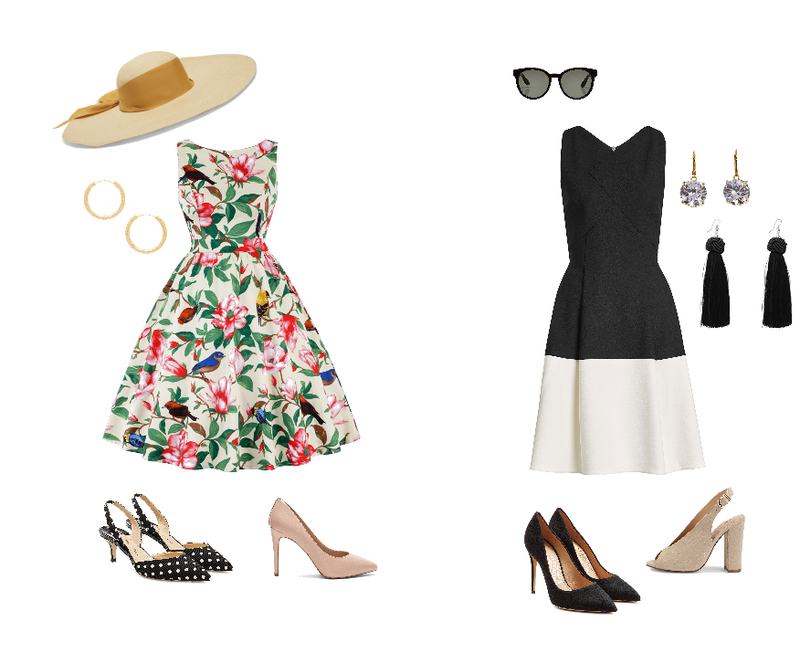 These ensembles are created using many pieces that most of us already own. 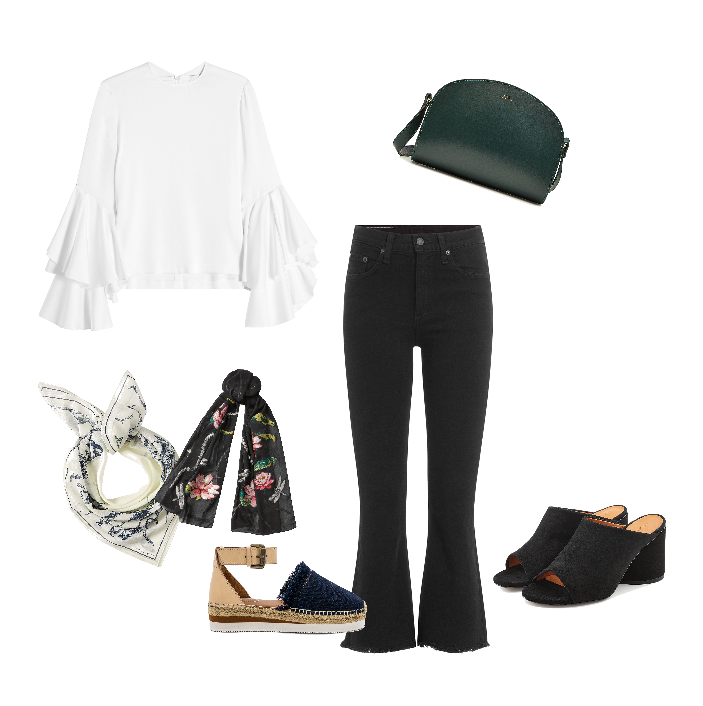 Incorporating looks like this into what you wear every day will have you dancing to your favorite Fleetwood Mac songs in no time. This look is a take on Stevie's iconic gothic style--a black ethereal dress paired with celestial earrings are chic and edgy, and a pair of heeled, knee-high boots in a contrasting suede finish the look in a classic Stevie way. No matter her ensemble, knee-high boots are often a big component. Stevie is also known for mixing and matching textiles and textures. If there's one thing we can take away from her style, it's to stop stressing about being so matchy-matchy! For a more casual look, we're in love with these flattering denim overalls paired with a boho kimono. The flared legs of the overalls are totally Stevie, and the embroidered star boots finish off the look in such a cool and effortless way. This outfit would look great with a little satin tank, as shown above, but any sort of graphic tee, tank top, or blouse would look totally cool with this whole ensemble. This boho look plays on Stevie's softer, more ethereal looks. A pair of earth-toned culottes paired with an embroidered, lightweight blouse are pretty and feminine, and a pair of white calf-high boots make the look a little sharper. A hat and beaded moon necklace are two accessories that are so Stevie. This is a great look for just about any day that can be worn casually or for something slightly more formal. This is a slightly bolder look that perhaps not all people would be comfortable wearing, but that's the beauty of fashion--pick and choose what you like, and incorporate Stevie's style however you may! A generation of young Western women who wore their hair in bobs, wore short skirts, and listened to jazz. Who are these women? Yes -- they are known as the flappers. The Flappers were relevant in the 1920's, and their fashion still does carry on today, but it is now known as vintage clothing. 1920's fashion, also known as the "Great Gatsby" time period, is a fashion era people will never forget. Many weddings are themed "Great Gatsby" today, and people seem to love events that are style after the black tie affair. The 1920's fashion era was a prominent era in history due to the fact that this is when fashion entered the modern era. So, what exactly were trends, in fashion and otherwise, that took place in the 1920's? Although it did seem that their fashion sense changed based off of who they were with, where they were going, and what time of day it was, these are some general fashion tips from the 1920's. Most clothing, that they wore, involved a mix of bright colors and geometric designs. People in the 1920's loved going to illegal speakeasies, and because this was a time period where people started having more money, they would spend there leisure time going to sporting events. The pop culture in the 1920's involved nightclubs, jazz, automobiles, and sports. 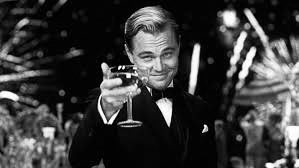 The Great Gatsby starring Leonardo DiCaprio is a terrific movie that represents the 1920's spot on. Sunday Funday is here! Whether you are going on vacation this week, next week or the next months here are some pro tips and must have during your trip! A lot of attention has recently been turned toward the waste that is carelessly & irresponsibly left behind by humans (most notably plastic) and its devastating effects in nature. Many people have joined the effort to boycott plastic straws and alternatively either opt for reusable straws or straw-free drinks. This is an awesome step for everybody to take, and even if it feels pretty small, every single effort like this will add up and create a cleaner, healthier, and much happier planet. Here are three other small & easy plastic-free changes you can make in your daily life to produce huge changes. If you're a regular coffee drinker, think about how many cups you drink per day, per week, per month, per year, and so on. Imagine all of your K-Cups sitting in a landfill, and then imagine your friends, family, and neighbors adding all of theirs. Like all plastic objects, K-Cups are not biodegradable, meaning that these hypothetical mountains of K-Cups will be around longer than we will. But there's an easy fix that also happens to save a lot of money: reusable K-Cup pods. These can be found at most grocery stores, drug stores, and online. Each pod is only a few bucks, and they can be used for months and months. After getting one of these, forget about ever having to buy expensive packs of plastic K-Cups again, and get a bag of coffee grounds instead. These grounds will last you much longer, and they can be half the cost. Once you start paying attention to the amount of plastic you use every day, you see it everywhere. One really simple fix that everyone can make is toothbrushes! Sure, we don't go through as many of these as K-Cups, but think of all of the (again, non-biodegradable) toothbrushes that get thrown away every year. For nearly the same price as the plastic ones that we pick up at drug stores, why not give a plastic-free, wooden toothbrush a try? There's literally no difference, other than that it's not made of plastic. Who wouldn't love that? Believe it or not, your shampoo & conditioner don't have to come in plastic bottles. We all know that soap can be plastic-free, but you can also buy various types of shampoo & conditioner in bar-form. And they are really nifty. Since shampoo & conditioner is something that most of us use rapidly and consistently, this is a really great way to eliminate huge amounts of plastic waste. And let's face it, most empty hair product bottles probably don't find their way into a proper recycling system. Speaking as somebody who has thick, curly hair, I was a bit nervous that shampoo & conditioner bars wouldn't give me as much hydration as liquid products. However, I have been using them for weeks now and I can genuinely say that my hair is healthier and more hydrated than ever before. Not only do these little guys cut out plastic, but they are also made naturally and don't contain all the processed ingredients that most name-brand products do. Better for our hair, and definitely better for our earth. Visit a LUSH store to try these for yourself! Each bar is about $12 and will give you 60-80 washes. Maybe these switches don't seem like much, but the more we each attempt to reduce our "carbon footprint," the bigger the changes around us will quickly be. These products are just three super simple switches that you can make to sincerely help the earth. Spread the word to family & friends! The more, the merrier. 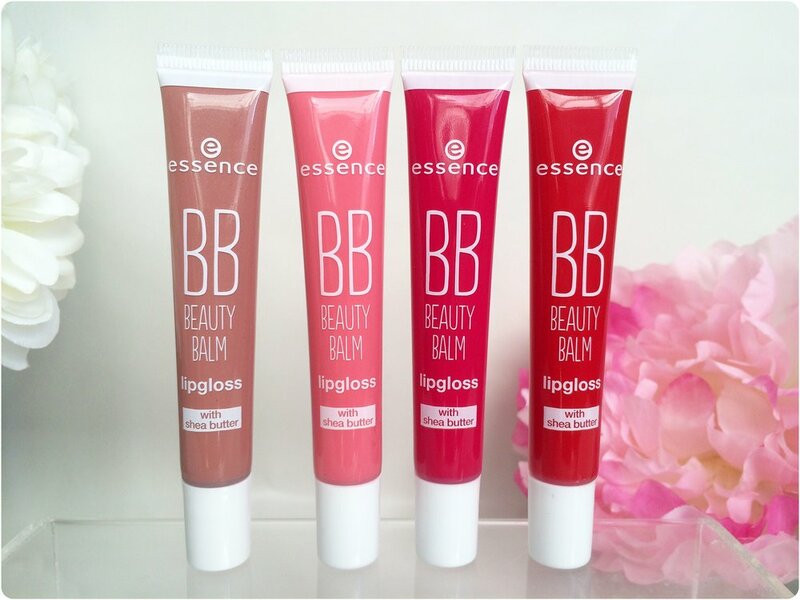 If you have any eco-friendly products that you love, or if you give any of these three a try, let us know! Last week, the CHC Internship Team did a photo/video shoot to start up their summer lookbook. These outfits included how to style bathing suits and dresses a particular way to fit any occasion. the internship team was not alone. A furry friend tagged along during the majority of the photo/video shoot, protecting the girls and being extremely loyal to them. No collar. Not microchip. This dog was a stray. The internship team could not leave the dog knowing the danger he could be in. They exhausted every single option possible and luckily, after the very last resource available was able to take in the dog, a happy ending occurred. A woman accepted the dog into her home where she decided she would keep him until the owner was found. Unfortunately, stray dogs usually do not have happy endings. So, today I will be sharing safe places to take a stray dog. 4. All 4 Paws Rescue Inc.
Help support your local stray animals & offer a helping hand every change that you can because you really could save a poor, innocent life. Happy Sunday and a happy Father's Day as well! Recently, the team did a photo shoot with dresses and swimwear! However, the whole release of photos will not be out until next week! The team went to Millvale Riverfront Park and everything flowed nicely. If you like our blog, check out our Instagram to see the some photos of this photo shoot! In every little town, and even big city, there is always a cute diner that has absolutely delicious food. Most of the time they are big on their breakfast foods, but they are also very hip on serving lunch/dinner foods. Something that I have come across is that each diner is famous for their desserts and milkshakes. Milkshakes are something that have always carried with us over time. They just have something about them that is hard to forget and extremely hard to replace. There is just something about them that does not make any diner want to take them off of their menu. Are they hard to pass up because of their taste? Or is it the fact that you can drink it at any time of the year? Or, maybe, is it because it is a drink that replaces a dessert? Whatever the reason may be, the Classic Chocolate Milkshake will never go out of style. Some even refer to it as an old-fashion, vintage drink; hence the term "classic". So, today, I decided it would be a great day to share with you all on how to make a classic chocolate milkshake. Well, first you need to have all of the ingredients . . It's pretty simple, all you need is: 3 scoops of vanilla ice cream, 1 cup of milk, chocolate syrup (and obviously, a blender). You can add some toppings; which include: whipped cream and cherries (the classic way). 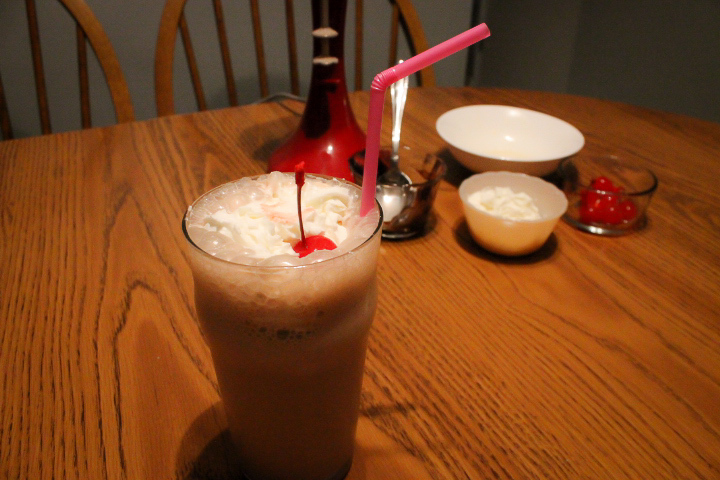 Check out our youtube video "HOW TO: Chocolate Milkshake" for a quick tutorial on how to put it all together (https://www.youtube.com/watch?v=tg49jxnFTLI&t=8s). Running out of ideas on this rainy Sunday? Well text your friends, spend time with your family or grab your umbrella to make this stormy day pass just a little bit faster than just sitting on your phone all day!